We’re seeing a welcomed upswing in burrito availability these days. 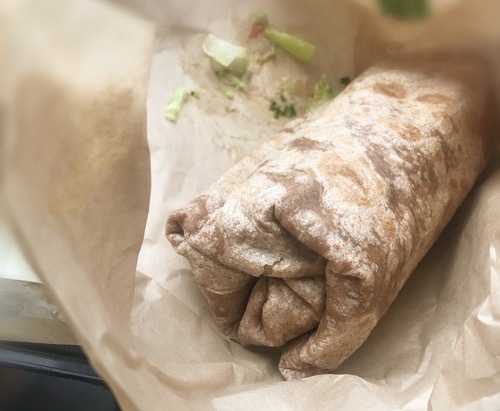 Grocery store delis are taking on their civic duty by adding burritos to their menus, and the days when we had to go with a wrap in lieu of the true original stuffed tortilla are slowly drifting away. PCC Community Markets in Columbia Park1 is one of the grocery stores that have taken the burrito bar to a legit level. Here a trained professional helps you customize a burrito to your own needs and desires. Every ingredient is fresh and the tortillas are prepared on-site, and I find myself forced to question if I can keep using grocery store burrito as derogatory slang anymore. The two base ingredients you build on are black beans and Spanish rice, wrapped in a flour tortilla of your choosing. I felt wholesome and went with a healthy whole grain option. It’s not an amazingly flavorful tortilla in and of itself, but it’s serviceable, and it didn’t go soggy. You can choose up to four additional toppings. That might not sound like a lot, but there are some flavorful, and even original, picks. You don’t see jicama slaw very often, but PCC’s got it, and mighty tasty it is. In place of more typical grocery store choices like ground meat and shredded chicken, you can go with pork adobado and chicken verde. That’s a decent step up on the highfalutin-meter, and one that makes a difference. The guacamole is available, but a more experimental avocado tomatillo salsa should be more tempting for a tortillaphile. Or go tropical with the grilled pineapple salsa. I mean, full respect if you enjoy a classic combo like sour cream or Pepper Jack, but the point is you get choices, and you really do not need more than four toppings. You can make an esoteric burrito without sacrificing fresh and clean flavors, thanks to the quality of the ingredients. Fresh, clean, and esoteric: those are words and burritos we all should get behind. Go support your local market if you want a quick fix — if it’s as good as PCC, you’ll feel better for it. And if it’s not, you might as well just do a fact-finding mission to PCC yourself. 1 And elsewhere — they have multiple stores in the Seattle area. Vote for PCC Community Markets: It’s your civic duty!